We all know Virginia is for lovers and that everyone loves New York, but what about Pittsburgh’s relationship with love? You may be surprised to learn the Pittsburgh region is a veritable Paris in Pennsylvania. To celebrate the city’s 250th birthday in 2008, 629 couples renewed their marriage vows, setting a new world record for the largest wedding vow renewal. Pittsburgh Mayor Luke Ravenstahl officiated at the ceremony and after the vows were renewed, champagne and cake were served. It shouldn’t be surprising. Pittsburgh has a world class reputation as a destination for love. Did you know in 2008, MSN.com ranked Pittsburgh’s Duquesne Incline as number three on their lists of the nation’s top 10 romantic spots? The incline shuttles passengers between the lower station on West Carson Street, up the steep side of Mt. Washington, to the upper station on Grandview Avenue. The incline, the walkway and overlooks, as well as the restaurants along Grandview Avenue all provide spectacular views of the city and inspire romance. When falling in love, there is a universal need to anchor those precious memories to a significant place. Lovers flock to Grandview Avenue to take in the spectacular cityscape below them. Hundreds, if not thousands, have professed their love while gazing out over the Golden Triangle. It’s a wonder the sidewalks have not been worn from all those bended knees! In downtown Pittsburgh, there are several places near and dear to the hearts of lovers. Point State Park, the spot where the city began, is also a favorite location for beginning a new romance. The expanse of water seems to flow out from the tip of the point, giving the feeling of a path laid out before you, possibly a path of love! “Meet me at the Kaufmann’s clock” is a well-known Pittsburgh phrase. 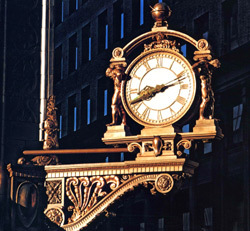 For decades the corner of Fifth Avenue and Smithfield Street, where a historic, ornate clock is situated, has been a rendezvous site for dates. One woman reportedly chose to meet blind dates there, telling the would-be suitors the specific clothing she would wear so they could spot her. She confessed she never really wore the outfit her date was looking for, so that she could walk by them unnoticed if she did not like the look of things. Today, Kaufmann’s no longer inhabits the building, but people still credit Kaufmann’s for the clock. Amusement parks often spark romance. There’s something about strolling the midway, hand-in-hand with one’s heart’s desire on a summer evening that is so romantic. In the Pittsburgh area, two parks play prominent roles in connection with love: Kennywood Park and West View Park. Kennywood Park, located in West Mifflin, has been in operation since the late 1800s. Near the entrance of the park is a ride which consists of a wooden boat that transports riders on a water course through dark tunnels. Throughout the decades this ride has sported many different names. Whether you knew it by the Old Mill, Hardheaded Harold’s Horrendously Humorous Hideaway or Garfield’s Nightmare, most everyone has stolen a kiss on Pittsburgh’s version of Venice’s gondola ride. West View Park, in West View Borough, provided amusement for the residents of Pittsburgh’s northern residents from 1906 until 1977. One of the things it was most famous for was Danceland. For decades this dance hall was to the place to go to meet potential partners. Scores of Pittsburghers met their prospective spouses in this art deco style dance hall that attracted such headliners as Bobby Goldsboro and even The Rolling Stones. Sadly, Danceland burned in 1973, leaving the romance of a night swaying to music to linger only in the minds of its former patrons. Over the decades other places in Pittsburgh have become rendezvous sites for romance. During the 1980s, Alexander Graham Bell’s, a bar in downtown’s Market Square, used Bell’s invention to connect people. A phone was situated at each table, with several more placed at the bar. Patrons could dial up someone who caught their eye or just play love “roulette” and randomly dial a number in the bar. Many couples received calls there that changed their lives. 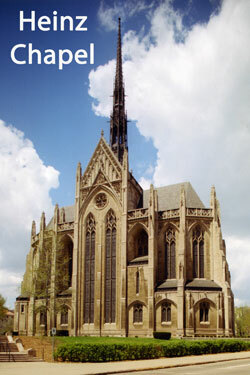 Heinz Chapel, on the University of Pittsburgh’s campus, has been the venue for hundreds of weddings. Since 1946, couples have been tying the knot in this gothic-style landmark. Couples must have some affiliation to the University of Pittsburgh to be wed there and competition for booking the cathedral is stiff. Technology has played a part in matchmaking at other locations as well. The big screen at the now-demolished Three Rivers Stadium and the current ones at PNC Park and Heinz Field have all broadcast proposals, and many dates have shared a kiss at Mellon Arena and the Consol Energy Center while being featured on the Kiss-Cam. Christmas time is always a popular season for engagements. In 1999, the Christian Leaders Fellowship constructed the world’s only authorized replica of the nativity (Creche) at St. Peter’s Basilica in the Vatican, right outside of USX Tower on Grant Street in Pittsburgh. With larger-than-life figures, the nativity inspires out-sized romance, too. Several couples have captured the magic of Christmas and love and have become engaged at this beautiful nativity scene. Once a couple falls in love, Pittsburgh tends to nurture that experience. In 2008, Forbes.com ranked Pittsburgh as the 9th best city for couples, noting its favorable marriage and divorce rates, housing affordability, and availability of family counseling. So if you’ve been “looking for love in all the wrong places,” you may want to consider Pittsburgh. The Golden Triangle is a beautiful and welcoming place for lovers of every generation, and many new families are finding that Pittsburgh is one of the nation’s best places to call home.